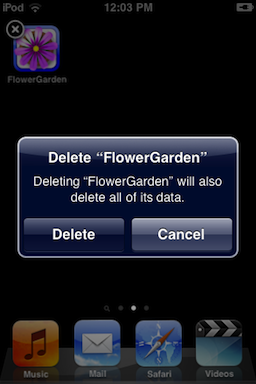 When you delete the Flower Garden app from your device, all the data is deleted too. A confirmation message is displayed before you can delete the app. Once you’ve deleted it, you can get your garden back by restoring your device from the most recent backup on iTunes or iCloud. If you don’t have a backup, you won’t be able to get the flowers you had in your garden, but you can still restore the purchases. If you have iCloud enabled, all the seed packets you had unlocked will be available as well.